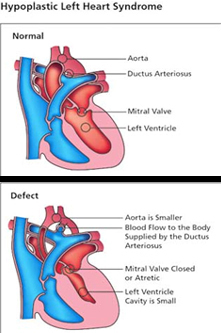 The goal of surgery in the neonatal period is complete repair of the heart defect whenever possible. Transposition of the Great Arteries : - In the normal heart, the right side of the heart pumps 'blue' blood (un-oxygenated) from the body to the lungs through the pulmonary artery (main artery to the lungs), while the left heart pumps "red" blood (oxygenated) from the lungs to the body through the aorta (main artery to the body).In the normal heart, the right side of the heart pumps 'blue' blood (un-oxygenated) from the body to the lungs through the pulmonary artery (main artery to the lungs), while the left heart pumps "red" blood (oxygenated) from the lungs to the body through the aorta (main artery to the body). In this defect, the position of the main vessels to the lungs and body is reversed so that the aorta arises from the right side of the heart and the pulmonary artery form the left side of the heart. The consequences of this reversal are severe, since blood which has gone to the lungs to pick up oxygen is not pumped to the body as it should be, but instead returns to the lungs. The only way blood with oxygen can reach the body is by passing through a hole between the upper collecting chambers and mixing with the "blue" blood. Total Anomalous Pulmonary Venous Return : - In the normal heart, pulmonary veins carry oxygenated blood from the lungs to the left side of the heart (left atrium), which pumps the oxygenated blood to the body. In a heart with TAPVR, the pulmonary veins connect to the right atrium, where the oxygenated blood mixed with the un-oxygenated blood through a hole in between the left and right atria. In the normal heart, pulmonary veins carry oxygenated blood from the lungs to the left side of the heart (left atrium), which pumps the oxygenated blood to the body. In a heart with TAPVR, the pulmonary veins connect to the right atrium, where the oxygenated blood mixed with the un-oxygenated blood through a hole in between the left and right atria. The mixed blood does not provide enough oxygen for the entire body. 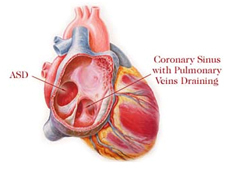 The surgical repair of anomalous pulmonary veins involves the redirection of the abnormal veins to the left atrium, usually by connecting them directly to the back wall of the atrium. Truncus Arteriosus : - In the normal heart there are two main vessels leaving the pumping chambers: the aorta, which carries blood to the body from the left side; and the pulmonary artery, which carries blood to the lungs from the right heart. In the defect known as Truncus, the two main vessels are fused into one large channel into which both pumping chambers empty. Hypoplastic Left Heart Syndrome : - HLHS is a severe congenital heart defect in which the left side of the heart does not develop during pregnancy. This means the left ventricle (the pumping chamber that sends blood to the body) and the aorta (the main artery that carries the blood to the body) and the mitral and aortic valves are very small and cannot support life. 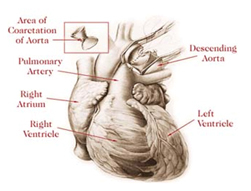 HLHS is a severe congenital heart defect in which the left side of the heart does not develop during pregnancy. 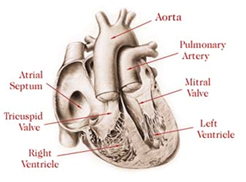 This means the left ventricle (the pumping chamber that sends blood to the body) and the aorta (the main artery that carries the blood to the body) and the mitral and aortic valves are very small and cannot support life. Surgical repair requires three stages to enable the single working chamber to do the work of two ventricles. The first stage, the Norwood I procedure is typically performed within the first 2 weeks of life. The second stage, the bi-directional Glenn, is typically performed before the infant is 6 months old. At two to three years old, the third, and final stage - the Fontan operation is completed.Rarely, the staged approach cannot be performed on an HLHS heart, and a Heart Transplant is performed. Ebstein's Anomaly : - In a normal heart, the tricuspid valve controls blood blow from the right atrium to the right ventricle. 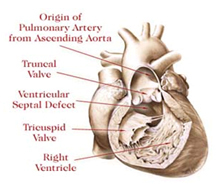 When a person has Ebstein's anomaly, the leaflets of the tricuspid valve are not formed correctly, and the valve is located lower than normal.In a normal heart, the tricuspid valve controls blood blow from the right atrium to the right ventricle. When a person has Ebstein's anomaly, the leaflets of the tricuspid valve are not formed correctly, and the valve is located lower than normal. The leaflets do not control the blood flow properly, resulting in a right ventricle that is too small, and a right atrium that is too large. 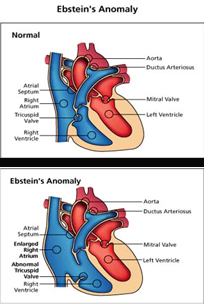 There are varying degrees of severity of Ebstein's anomaly, and there is usually an atrial septal defect.